For some reason, I find this really beautiful. 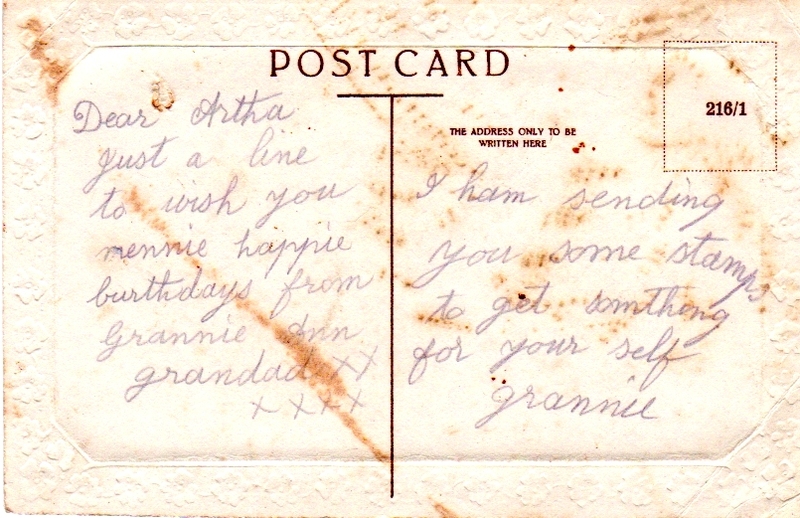 This postcard probably dates from between the wars — easily 1920 if not earlier. It's a wonderful piece of history from a woman who will be long gone. The card was clearly put in the envelope with the stamps. They can't have amounted to much, as any sum over a shilling or so would've been better sent as a postal order. I'd assume she put 10d or so of stamps in the envelope — 90p in today's money and an awful lot for a couple who probably only had the 7s 6d a week (? ?8) Lloyd George pension to live on. To a generous and loving Grannie: I salute you from 90 years into the future. Posted in Uncategorized and tagged archive, history, postcard on August 13, 2011 by Jamie Bowden-Smith. A nice little find on YouTube – some of the BBC Nine o’Clock News from 1978 and Jim Callaghan announcing that he has a better chance of winning an election if he goes to the country next year. Ah, if only. What Jim didn’t know was that Labour had peaked in the polls. He was hoping that the rise in support would continue, but Labour, Old Labour, was about to be brought down by the unions over the winter of 78/79 – with help from the rabidly Tory press. Prime Ministers are usually good about knowing when to go to the country. This is what makes Callaghan’s decision to stay on in 1978 stand out. Gordon Brown did the same when he became PM in 2007: Labour had got a boost in the polls from Blair’s resignation and the party wanted to use this to call a snap election and get a new mandate. Brown eventually decided against it, fearing that being re-elected with a reduced majority would hole his premiership under the water. We now know it was already taking on water and the ‘credit crunch’ we were starting to hear about collapsed into a financial meltdown and spelt the end of Labour’s hard-fought reputation for economic competence. This clip from 1978 shows how much television has changed too. When did you last see a clock on TV? Clocks on TV were once vital, if nothing else because many people didn’t have clocks – reliable clocks were historically expensive items. TV news now, Sky’s thundering presentation aside, doesn’t go for that urgent-clattering-typewriters-HERE-IS-THE-NEWS type of music any more. Our newsreaders are now journalists, rather than the actors we employed back then. Whether this is helpful or not for a straight reading-out-the-news role isn’t clear, but then TV news doesn’t go for that style any more either. TV news prefers to show us journalists talking to other journalists about what a third group of journalists are thinking. Radio news still employs the actors to read the stories in a clear voice at least, albeit not Kenneth Kendall and Angela Rippon any more. The cold open on the PM’s statement is also something you wouldn’t see now – a shame because it’s very effective – but you often still get the instant rebuttal from the Leader of the Opposition, more so when it was Brown/Cameron than we’re currently getting under Cameron/Milliband (not sure why that should be – media bias or Labour still in disarray? Probably a bit of both). For the sake of balance, here’s some of ITN’s News at Ten from the same year (different day, duller stories), plus some ads (including Vila from Blake’s 7 eating Stork!) and some Thames continuity (but no clock). Look, it’s Denis Howells! Best. Minister. Ever. Made Minister for Drought and two days later: flooding! We don’t see action like that any more. I miss many elements of the BBC presentation of news, which works very well even now – on a busy news day. However, the ITN clip proves that this type of presentation on a slack news day is so very very dull. Or at least very very dry. Mind you, current news presentation on a slack news day doesn’t work either: journalists demanding that Something Must Be Done about very little is just as nerve-shearing as journalists reading out facts to fill space was back then.